Classic Hitchcock mystery with overtones of light comedy and romance, as innocent Donat is pulled into spy-ring activities. Memorable banter between Donat and Carroll, who thinks he's a criminal, set style for sophisticated dialogue for years. 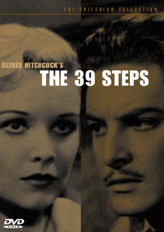 The film was remade in 1959 and 1978. 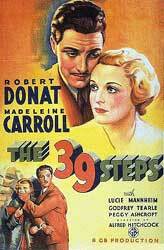 The first scene filmed was the escape, where Madeleine Carroll and Robert Donat run handcuffed. Both actors had never met and Hitchcock hancuffed them hours before the scene was taken arguing that he had misplaced the keys when in fact he had given them to a studio security man. Tossing some litter while Robert Donat and Lucie Mannheim run from the theater, seven minutes into the movie.